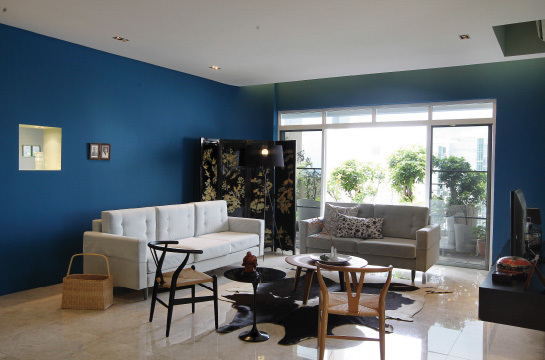 An unmistakable deep blue wall wraps like a ribbon around the two living rooms, separating them in style but tying them together with colour. The formal living room has baroque décor, while the family living room has a Chinoiserie element. The curvature at the corner of the walls adds to the gentle ribbon effect. 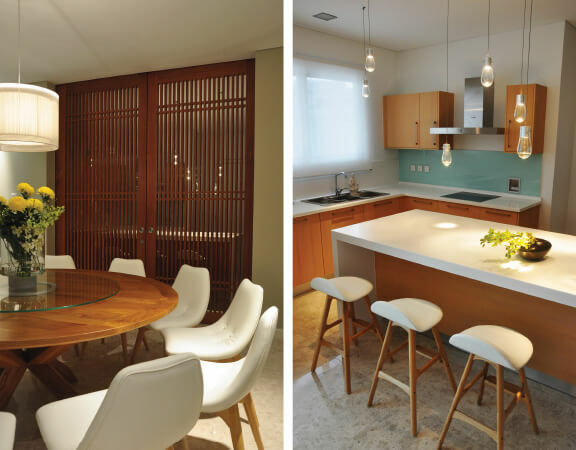 The sliding doors dividing the dining room and kitchen are a modern take on Chinese lattice work. It was a challenge to fit these doors as they had to be painstakingly carried up to the 24th floor. Pendant lights are a decorative element throughout the home and the kitchen is no exception. These lights are specifically designed to be placed in their respective locations. This article first appeared in haven, The Edge Malaysia, on Issue #81 October + November 2016. 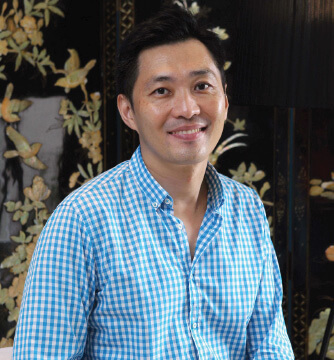 It is not often one has the luxury of revisiting an old project, but interior designer Lim Hwa Hong was given this opportunity with a four-bedroom, 4,000 sq ft penthouse in Hijauan Kiara, Taman Sri Hartamas, Kuala Lumpur. It was his first interior design job, in 2009, and he was called back to freshen up the space, giving him the unique chance to relook his design decisions after seven years. Takayama geometric clock made from solid walnut on the dining-room wall. Much of the rest of the unit carries the same aesthetic — a rich, striking coloured wall with functional decorative items. The unit’s seamless flow opens up the minute you step in from the lobby and it is clear that the owner has a preference for streamlined furniture, with nothing opulent or excessive. Knowing he had to place function over form, Lim concentrated on making the light fixtures decorative and interesting — a throwback to his salad days. “When I started out on this job, I was fascinated by pendants and had one in almost every corner,” he reveals, referring to the artichoke lamp in the formal living room and other light pendant lamps in the kitchen, dining room and study nook. “In hindsight, I’d probably do less pendants,” he says sheepishly, adding that beyond this, he would have made the same design decisions for everything else in the penthouse today. And the risk clearly paid off: The unmistakable deep lucid blue wall wrapped around the two living rooms makes all the other accents pop. While the formal living room has a baroque décor, there is a Chinoiserie element in the family living room. Instead of a pendant lamp, an upright lamp set against a black Oriental screen gives the illusion of the bulb representing the moon, while passing off as artistic necessity. “It’s divided in style yet united because of the colours, like a ribbon that goes around and ties the two spaces together,” Lim says of the definitive design element. Previously, the wall was thinner and stopped short of being a divider, leaving an awkward space. The ribbon effect is further enhanced by the curvature of the wall, giving the room a gentle flow. Apart from thickening and lengthening the wall, he added a window void to break the solid colour block and connect the two spaces. Of all the spaces in the penthouse, the lobby feels like it has the most elaborate décor, probably because the area is rather narrow. 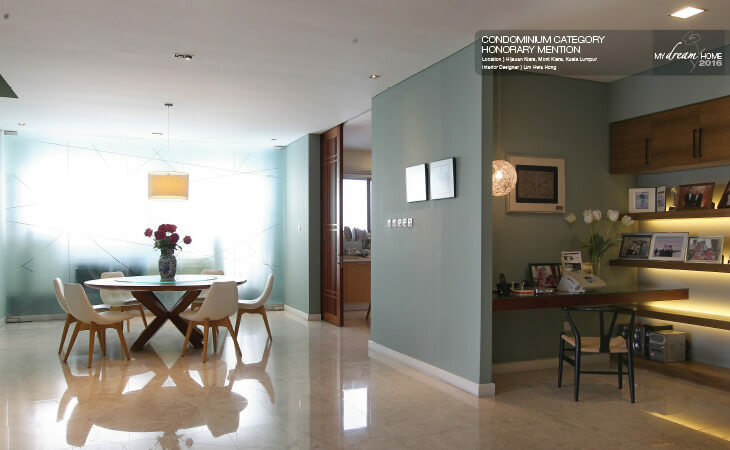 But step out of the unit’s private elevator and you are greeted by the wow factor — a statement artwork on waterlilies by Soon Lai Wai, set against a subtle white-and-teal wallpaper that contrasts really well with the brown teak of the floating console. The bare walls beside the elevator are also covered with a timber veneer, Zebrano, called such as it resembles zebra stripes. And tucked in one corner of the room is a mirror cabinet that is meant to “dissolve” into the wall. Customisation is a key factor in this penthouse. The divans and sofas, an ottoman, a round dining table and chairs were custom-designed, fabricated and upholstered by a sofa specialist in 2009. This time round, they were rejigged and repaired. The biggest customised item, however, were the sliding doors dividing the dining room and kitchen, a modern take on Chinese latticework. Fitting that proved to be the biggest challenge as it could not fit into the lift and had to be painstakingly carried up to the 24th floor. “Simple” is the key word here, and it is obvious that despite the budget constraints, Lim was given carte blanche to apply his aesthetic approach in the penthouse, all the while keeping things decorative yet functional. Ultimately, his aim was to carve a space where his client could be contented. Add to that the enduring friendship between the two men and you get a home cemented by trust and understanding.